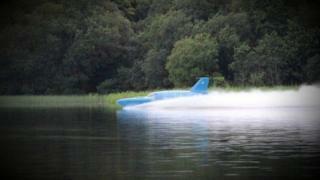 Donald Campbell's rebuilt Bluebird has travelled at 100mph during a test run on a Scottish loch. The hydroplane crashed on Coniston Water in 1967 during his attempt to break his own water speed record. It has been painstakingly restored by a team on Tyneside, and is being tested on Loch Fad on the Isle of Bute. During the test, the cockpit's canopy came off as the craft slowed down, and modifications will be made before the next run. Project Bluebird posted on social media a picture of part of the canopy they managed to rescue from the lake. Campbell, 45, was killed when the Bluebird K7 - travelling at more than 300mph - flipped and crashed. The vessel was salvaged in 2001. Bill Smith, who led the restoration project, said: "We'll be basically training ourselves on Loch Fad because no-one really knows how she will handle. "Once this is done there's always been the hope that she'll be displayed at speed back in Cumbria." Ted Walsh, the pilot at the controls when it hit 100mph, said: "Off the old girl went like a scalded dog, basically."